there is only one Water-Jel! 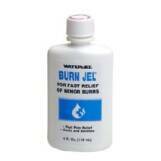 Freedom Sales and Supply, LLC offers several burn products including Burn Ointment with Lidocaine and Cold Spray. 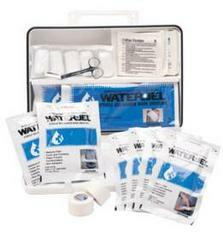 In our opinion, Water-Jel is the most effective burn care treatment available in the industry today. Water-Jel is a water-based, water-soluble gel that draws the heat out of a burn while it relieves the pain, cools the skin, and protects against airborne contamination. By applying Water-Jel as soon as possible, the heat of the burn is dissipated and helps prevent the heat from progression deeper into the skin. The gel consists of 96% water and has the same cooling effects as water, but because it is thick, it stays on the burn and doesn't evaporate. Water-Jel also contains thickening agents and preservatives to maintain the gel's viscosity, efficacy and give it a 5-year shelf life. Water-Jel has been adopted by first responders, including EMS, Fire Departments and the police. Water-Jel is widely used in industrial and manufacturing plants, food service settings, welding sites and the military. Water-Jel Technologies worked together with specialist all around the world to meet the high requirements for the pre-hospital treatment of burn injuries. There are 4 primary requirements for the treatment of burn injuries accepted internationally and Water-Jel fulfils all 4 together in just one simple step. 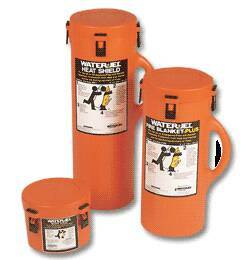 Water-Jel burn dressings and fire blankets can absorb temperature in excess of 2.000 Degrees Fahrenheit (1.100 Degrees Celsius). Human tissue begins to cook at 108 Degrees Fahrenheit (42 Degrees Celsius), human bone carbonizes at 1.400 Degrees Fahrenheit (760 Degrees Celsius), a very deep heat sink is required to take away these levels of temperature quickly, to prevent further dermal necrosis and take away the pain, giving comfort to the casualty. Because of its gelatinous nature Water-Jel will ensure that site fluids will not evaporate through or soak into the dressing. Water-Jel dressings carry approximately 13 times their own weight in gelatinized sterile water, these dressings may be lifted off site for wound assessment at any time during management without fear of them adhering to the burn site. Water-Jel's specially formulated sterile and bacteriostatic gel has a clinically calculated volume per square centimeter formula for maximum effectiveness and coverage of all zones (Hyperemia, Stasis, Coagulation) of the burn site. The carrying medium is a patented sterile woven polyester, providing a lay-over application feed system. NB. pressure should never be applied to a burn site or its surrounds in an effort to achieve greater coverage. Water-Jel has also been tested for its microbiological efficiency, offering positive inhibition for the following micro-organisms: Staphylococcus aureus, Pseudomonas aeruginose, Bacillus subtilis, Candida albicans, Aspergilus niger. Water-Jel burn dressings and fire blankets do not induce hypothermia, because of their special formulation, the heat of the burn site is absorbed into the gel where it circulates in ever increasing circles drawing the heat out of the burn, this in turn leaves the burn site covered by a warm dressing from which the excess heat is released to the surrounding atmosphere. Hold your breath! Watch this video and see how Water-Jel CEO Mike Lorelli volunteers for a trial by fire, using a Water-Jel Burn dressing to shield his arm from the searing heat of a 2,600 degree blowtorch. He demonstrates the unbeatable quality of Water-Jel in this incredible test.